Welcome to the Tuesday edition of the Surf Report. Sunday morning I listened to a great discussion in small group. The topic was on evangelism and how there are different roles in bringing others to Christ (sowing, watering, reaping, etc.). Saturday, my father-in-law came over and helped me take down the handicap ramp out front. Looks much better now. Phase I of our front entry project. Friday night I had some time to myself. So I fired up the PlayStation 3 and decided to pick Tomb Raider back up. About an hour and a half later, I found that my opinion of the game has not changed. Tomb Raider is a videogame that basks in tension, torture, and somehow female empowerment. The entire time I was playing I kept thinking, “I wish this was an Uncharted game.” I wanted the fun of Indiana Jones and the Raiders of the Lost Ark versus the seriousness of Indiana Jones and the Temple of Doom. Six missions left until the end of the game. I will persevere. – Also, I enjoyed The Theology Gaming Podcast #33 – A History of Healing. Great discussion! Would love to hear other topics such as: resurrection, circumcision (as mentioned), baptism, etc. I can’t wait for Phase II. 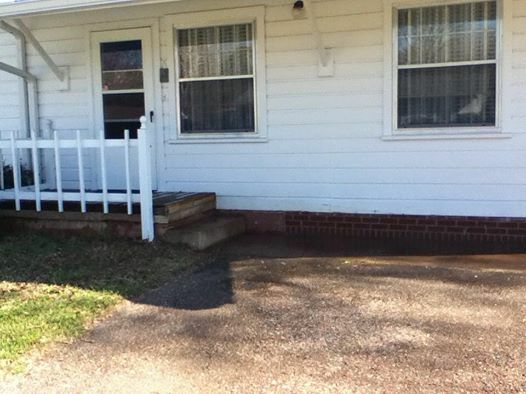 Going to block off the steps, open up the front of the porch, and create a walkway into the yard. Will definitely up the curb appeal. Glad you liked the healing convo! Tomb Raider just needed some areas that aren’t ugly. That’s all. Or at least let me not solve puzzles in the filth of a thousand rotting corpses. That’d be nice. Reminds me that I need to finish Uncharted 3 one of these days. I recently started it over again. Probably just need to fly to my latest save and power through… Have you finished all three of them? Have you watched the TV show Arrow at all? In between the crime fighting bits are flashbacks to “the island”. The island is where the series protagonist, Oliver Queen, was shaped and refined into Arrow. Anywho, the island that Tomb Raider takes place on reminds me of the island from Arrow. Just not a nice place over all. I have indeed completed the Uncharted trilogy. Uncharted 3 is probably my favorite. I love The Last Crusade bits at the beginning with young Nathan Drake and Sully. If the franchise were to retire on #3, I’d be happy. Otherwise, can you think of any other Indiana Jones-like games? Good call on the Arrow bits. I know exactly what you mean even only after seeing three episodes. Also, what would you think about doing a podcast on the topic of resurrection? Absolutely. The only difference is that you can only compare your daily scores with people on PS3. And I’m on Steam. But I understand the preference. It’s a fascinating game. Just very different from anything else other than descending roguelikes. Controls weren’t my favorite. Worth sticking with? Yeah. I get what you’re after, I think. It’s just that after a few hours of playing Spelunky, it really transforms into a fascinating game of risk assessment where you’re almost always getting really far. Plus Daily Challenges are kinda amazing.